radiant crown, as evidenced by the holes for the insertion of the metallic pieces. 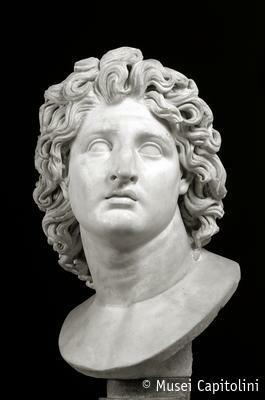 Winckelmann identified the figure with Alexander the Great, and the expression of suffering (pathos) in the idealized features and in the posture may well apply to the Macedonian king. The presence of the crown indicates that he was represented as the god of Sun Helios, probably in relation to the statue made in Rhodes by the famous sculptor Lysippos or by his pupil Chares of Lindos. The work dates to the time of Hadrian (117-138 AD) and is a copy of a Greek original made in the early III century BC in the Rhodian area or, less probably, of a Late Hellenistic Pergamene School work.